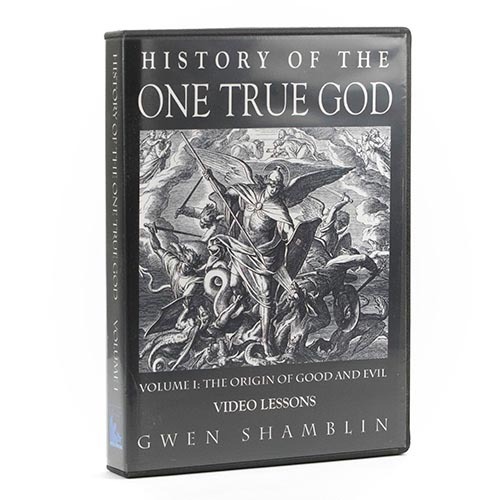 This set includes video lessons of the six chapters in Volume I of History of the ONE TRUE GOD, written by Gwen Shamblin. The intent of this series is to chronicle history from the ongoing Spiritual War of the Heavens with Satan, to the earthly war of lies on Adam and Eve, to the establishment of Jerusalem. The series continues with a brief overview of church and religious history to the present religious state of America, and ends with the rise of the New Jerusalem. Also available in hardback book and audio book. Beautiful and clear account of Genesis Chapters One through Eight and how these events effect us to this very day. Hear the history of Lucifer's fall from Heaven, the creation of the world, Adam and Eve, Cain and Abel, and Noah from the perspective of the great love the Creator has always had for mankind and the great appreciation that is due Him in return.